In brief remarks at the ceremony, Junior Minister responsible for Social Development Hon. Hazel Brandy-Williams, lauded the seniors for the foundation they built which paved the way for a modern Nevis. “You are the foundation builders of this island of Nevis. It is through your hard work and dedication to family and community why we, the younger generation, now have the opportunity to enjoy a better standard of living. You have contributed immensely to nation building and this is why I wish to salute you this evening for a job well done. 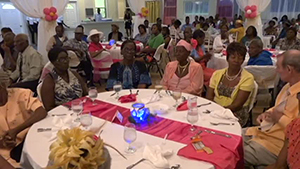 “The theme chosen for this year’s celebration is “Leaving no one behind; promoting a society for all.” This theme is quite fitting, as the Nevis Island Administration, through the Department of Social Services, continues to seek avenues to foster a society for all and especially for you, our seniors,” she said. The Minister noted that the Administration thought all seniors should be treated fairly and respected. 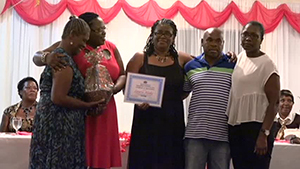 “It is our belief that all seniors should be treated fairly, respected and allowed to live a life of dignity and that is why we continue to acknowledge your achievements in agriculture, in education, in community service, in culture and in all the other areas that you have contributed in making Nevis the halcyon place that it is. 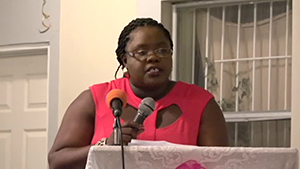 “Tonight, we will honour seniors for their sterling contributions in the development of Nevis. Tonight’s activity… is planned especially for you. So you are expected to enjoy it. We are here to show you how much we appreciate your effort in nation building,” she said. Mrs. Brandy-Williams also spoke of their other social contributions and encourage the seniors to get involved in activities available to them. “Many of you would have worked extremely hard raising your children and so now that your children are fully grown, they have gone on to make their own lives. “It is time for you to enjoy your life and to engage in the activities that you were not able to engage in when you were raising them,” she said. 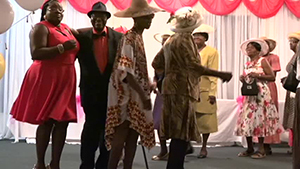 The Social Development Minister used the opportunity to call on family members to find time to spend with the seniors. “I continue to urge the family members to spend quality time with our seniors. Sit with them. Share with them and most importantly, learn from them as they are the treasure chests of knowledge and wisdom. They have trod these roads before. They have left their footprints for us to follow. They have a legacy. “We too should want to leave behind a legacy quite pretty as the ones that you seniors are leaving behind and so as we continue to celebrate our seniors, let us say thanks to them for paving the way for us,” she said. The Minister also expressed thanks and gratitude to the staff of the Seniors Division who panned the event and the month of activities for the island’s seniors. 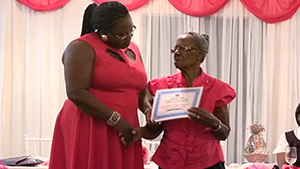 The honourees were Ms. Lucina “Mama Lou” Dore of Charlestown for her contribution to Entrepreneurship, Mrs. Mary Brown, a Seamstress of River Path in Gingerland who was not present at the event and Ms. Laura Blake of Brick Kiln Village who was awarded posthumously for her contribution to the development of Culture.